“Sobia is the most popular drink in Ramadan; it is sold almost on every street corner. Saudis like to break their fast with a cold glass of Sobia to give them energy and power,” said Um Tariq, a 78-year-old citizen. “I have witnessed my mother and grandmother preparing this drink ever since I was a child, and now I’m proceeding with this tradition and teaching my grandchildren how to prepare our famous Sobia recipe,” she added. Sobia is a local refreshment drink prepared especially for Ramadan. The drink is on high demand during the holy month in the Western Province. Um Tariq has been making Sobia for years and has been sending the drink to her friends and neighbors every Ramadan. “I start preparing Sobia in the first couple of days of Ramadan every year,” she said. “I buy a huge number of containers, so I can send Sobia to the people I love to share my cooking with,” she added. “Sending food to neighbors and friends is an old tradition that we used to practice when we lived in Makkah, when it was a very small city and everyone knew each other,” said Um Tariq. Um Tariq said that Sobia needed a special preparation to make it taste good. It needs ingredients including barley, brown bread, cinnamon, sugar, and cardamom. “Brown bread and barley should be soaked in a large pot for a whole day with enough water to cover it. Then the mixture should be boiled, adding some cinnamon and cardamom and leave it soaked for another day,” she said. “After that, the mixture should be filtered, separating the water from the bread and adding sugar to it,” she added. “The drink should be served cold and you can add ice as needed,” said Um Tariq. Sobia has two colors, white and red. “The one I just mentioned is the white one. Some people like to make Sobia look festive, so they add some food color to it; most of them choose the color red,” said Um Tariq. 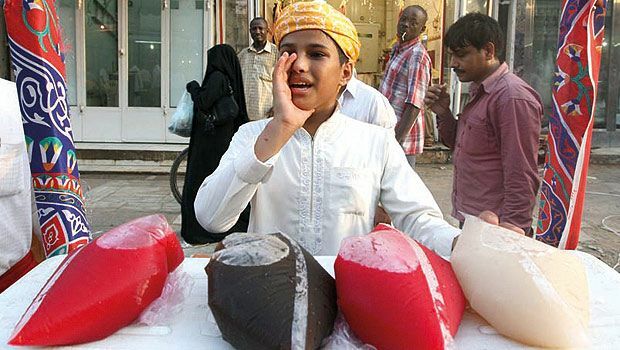 Many Saudis make profit from selling Sobia in the streets. Locals, as young as 12 and as old as 70 years old, sell Sobia during Ramadan. “They put their Sobia in plastic bags and sell it. The price per bag of Sobia ranges between SR5 and SR10. Selling Sobia is a job that doesn’t fade, even if the man selling it has another job. “I am a school teacher and I work part-time only in Ramadan selling my homemade Sobia,” said Saleh. “The income I make from selling it goes up to SR150 a day and although this is not much, I only do it to keep the tradition alive and to celebrate it,” he added.